I’ve been terribly busy lately, which is a good thing when one freelances, but it has meant my neglecting you, my Faithful Bloglodytes. I hope to be able to share some of the projects I’ve been working on so diligently in the near future. One event which took me away from “the closet” for a weekend was the 2010 SPX in Bethesda, Maryland. 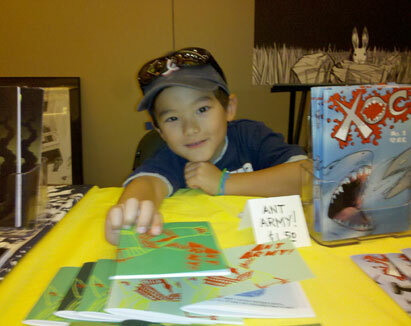 I attended “North America’s Premiere Independent Cartooning & Comics Arts Festival”—as it bills itself—in 2009, as an exhibitor for Fanfare/Ponent Mon, a UK-based indie publisher of translations of graphic literature from around the world. My reasons for going to this year’s indie comics love-in were the same. Those “Closet” fans with a better memory than mine may remember my mentioning the event in a posting in which I recounted meeting Adam Dembicki, four-year-old son of comics creator Matt Dembicki, whose artwork—a sweet gift which I still cherish—I displayed with a challenge to readers to guess the piece’s subject matter. I am not a spoiler, so won’t reveal the answer here. Imagine my surprise when I learned that not only would Matt and Adam be attending this year, but also Adam, himself, had written and drawn a complete book of his own and was going to be doing signings during the show. I had no delusions that the now five-year-old Adam would recall me—Hell, I’m shocked when my wife remembers me every morning—but looked forward to seeing his cherubic face and heart-melting smile, nonetheless. And giddy with anticipation to get my greedy little paws on a copy of his book. I saw Adam as an artistic genius and couldn’t wait to see how much he’d grown as such. 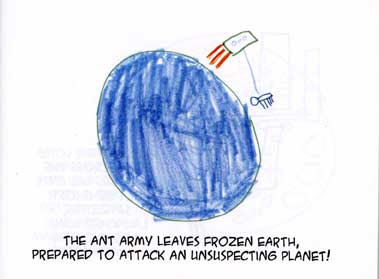 On its surface, Ant Army is about a war between an alien planet and an invading race of formicary forces from “frozen Earth.” That this anthropod army passes long-abandoned “ghost satellites” on their mission of conquest, suggests the tale is a futuristic one and the ants are a product of millennia of evolution born from the ashes of mankind. The aliens initially welcome the visitors, unsuspecting of their duplicitous nature, then scramble to defend themselves when the ants’ attack. The battle grows to epic proportions. The aliens proving surprisingly resistant, but the ants are relentless. Counterattack begets counterattack, each wave escalating in its use of bigger and more destructive weaponry, with the outcome always in question. The ending is worthy of an episode of The Twilight Zone at its best, all at once shocking and haunting, and serves as a brilliant coda to the story’s themes war and genocide. It still gives me chills when I think about it. 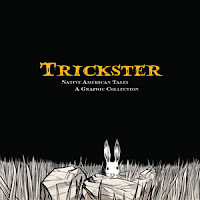 According to editor/production manager/Dad Matt—artist/writer of the undersea adventure Xoc and editor/contributor of the recently released comics anthology of stories inspired by Native American myths, Trickster—Adam drew the pictures first, after which he explained the story to his father, who typed out the words and put the book together. For his age, Adam presents a surprisingly sophisticated tale. I expected something along the lines of “Hulk, smash!” similar to the way children of his age play with their action figures. It’s the details that stand out and elevate Ant Army above such puerile fare: the aforementioned ghost satellites; the strategies the opposing armies use against one another; the breadth and savagery of the battle; the book’s ability to continually surprise; and its jaw-dropping finish. My mind reels at what Adam has in store for us in the future. And I cannot wait to find out! 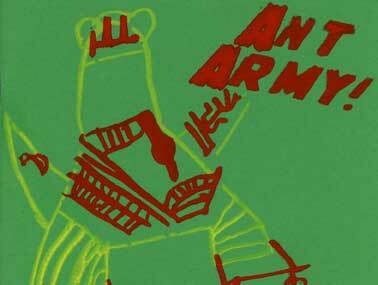 Ant Army gets four anthropo—er, spiders. Awesome review! I agree, Adam is a young artistic genius, following in his dad's footsteps. I look forward to buying a copy at the Richmond Zine fest!